Do you have a vested interest in a building at the Park? Did your relatives donate a building? Your business? Was your great grand mother a seamstress? The Park invites you to adopt a building in the village! 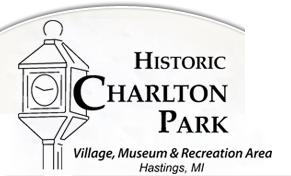 How it works: On an annual basis, Historic Charlton Park will present a cost estimate for the work to be completed the following year. The adopting party will then determine at what level to participate financially that year to assist with the maintenance of the adopted building at Historic Charlton Park. Upon completion of the work, a bill will be issued to the “adopter” with the vender invoice for confirmation of cost. The Hastings Mutual Insurance Company has adopted their original home office that they used from 1885 to 1908 which was moved to Charlton Park in 1975. Also, Hastings Charter Township has adopted their original town hall which was moved to Charlton Park in 1981. The other 13 buildings in the village are currently in good shape, but are looking to be adopted to assist with long-term care. Send an e-mail to Park Director Dan Patton at dpatton@barrycounty.org or call 269-945-3775. Adopt a Landscape started in 2007 with the help of the Michigan State University Extension Master Gardeners. Individuals or groups may adopt the gardens associated with one of Historic Charlton Park’s buildings, develop, and maintain an historic garden. Adoptions are for one year at a time and can be renewed every year. The process is easy; you will be provided with a list of plants to choose from that, once planted, will only require minimal maintenance through the growing season. A small sign with your organization’s name will be placed in the garden you adopt. If you are interested in participating, call 269-945-3775 or e-mail info@charltonpark.org. The application to adopt a building or landscape can be found here.